Eataly's vegetable counter specializes in vegan dishesspecifically, vegan dishes that people might not suspect are vegan. One is this thick, hearty soup made with a colorful mix of carrots, peas, leek and onion. 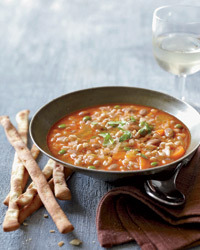 Mario Batali also adds borlotti beans and farro, which make the soup hearty enough to be a main course. The crunchy grissini on the side aren't vegan; they're sweetened with honey. Pairing: Ripe, fruity Italian Sylvaner: 2009 Abbazia di Novacella. 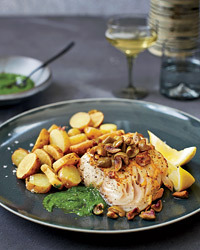 At Canlis, chef Jason Franey uses small Yukon Gold potatoes in this dish, but sliced fingerlings are great, too. Pairing: Champagne: NV Jean Milan Canlis Cuvée. 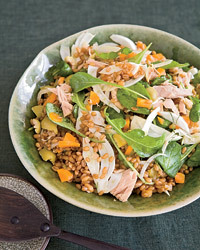 For this Mediterranean-inflected salad, chef Seamus Mullen likes poaching fresh tuna or bonito in olive oil; store-bought fish jarred in olive oil works very well, too. Pairing: Full-bodied Spanish white: 2009 Rafael Palacios Louro do Bolo Godello. 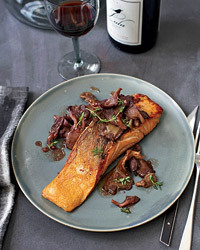 Jason Franey makes the most of the superb mushrooms that grow in the Pacific Northwestfor instance, pairing sautéed chanterelles with roasted salmon and figs in a red wine sauce. Since chanterelles are not always easy to find (and are expensive), oyster mushrooms are an ideal substitute. Pairing: New world Pinot Noir: 2008 Hirsch Vineyards Lulu Canlis from Sonoma or 2007 Kooyong Massale from Australia. Skirt steak, nicely marbled with fat, takes well to marinades, like this simple mix of herbs and garlic. 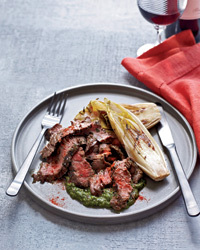 Mario Batali accents the grilled meat with a sauce made with more herbs and garlic, plus capers and anchovies; he likes to make his salsa verde superthick.